A violent pestilence which ravaged Europe between March, 1348, and the spring of 1351, and is said to have carried off nearly half the population. It was brought by sailors to Genoa from south Russia, whither it had come from central Asia. During March and April, 1348, it spread through Italy, Spain, and southern France; and by May of that year it had reached southwest England. 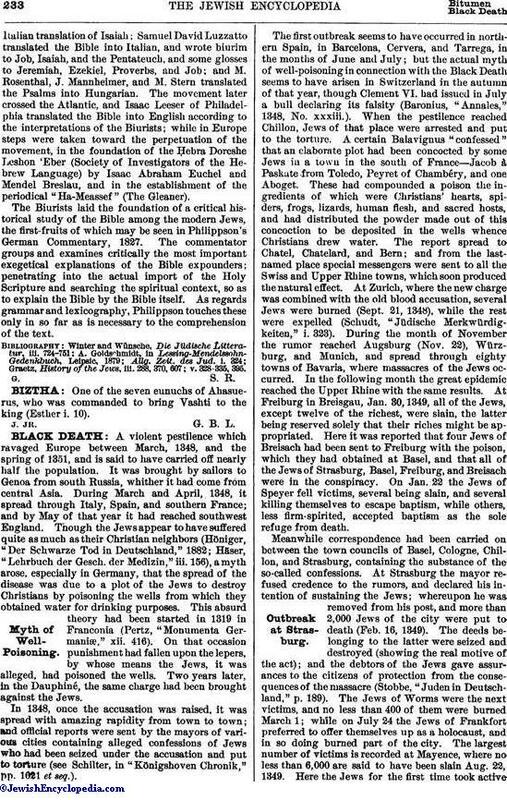 Though the Jews appear to have suffered quite as much as their Christian neighbors (Höniger, "Der Schwarze Tod in Deutschland," 1882; Häser, "Lehrbuch der Gesch. der Medizin," iii. 156), a myth arose, especially in Germany, that the spread of the disease was due to a plot of the Jews to destroy Christians by poisoning the wells from which they obtained water for drinking purposes. This absurd theory had been started in 1319 in Franconia (Pertz, "Monumenta Germaniæ," xii. 416). On that occasion punishment had fallen upon the lepers, by whose means the Jews, it was alleged, had poisoned the wells. Two years later, in the Dauphiné, the same charge had been brought against the Jews. In 1348, once the accusation was raised, it was spread with amazing rapidity from town to town; and official reports were sent by the mayors of various cities containing alleged confessions of Jews who had been seized under the accusation and put to torture (see Schilter, in "Königshoven Chronik," pp. 1021 et seq.). 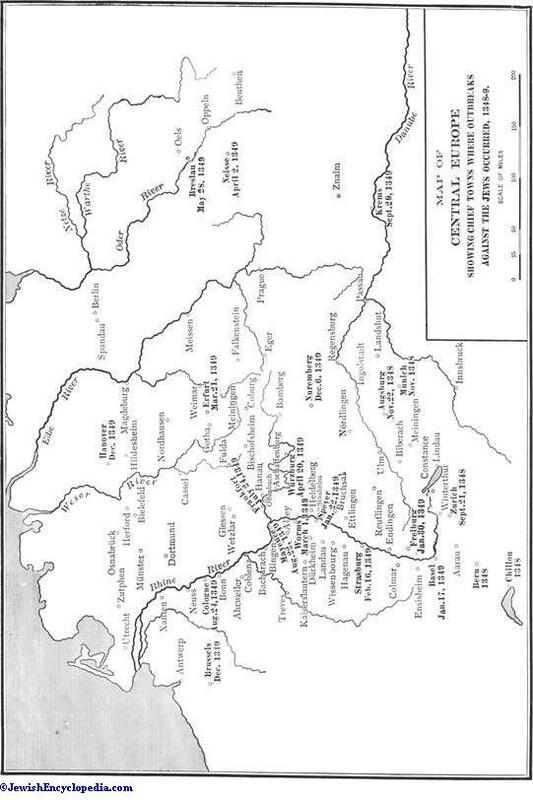 The first outbreak seems to have occurred in northern Spain, in Barcelona, Cervera, and Tarrega, in the months of June and July; but the actual myth of well-poisoning in connection with the Black Death seems to have arisen in Switzerland in the autumn of that year, though Clement VI. had issued in July a bull declaring its falsity (Baronius, "Annales," 1348, No. xxxiii.). When the pestilence reached Chillon, Jews of that place were arrested and put to the torture. A certain Balavignus "confessed" that an elaborate plot had been concocted by some Jews in a town in the south of France—Jacob à Paskate from Toledo, Peyret of Chambéry, and one Aboget. These had compounded a poison the ingredients of which were Christians' hearts, spiders, frogs, lizards, human flesh, and sacred hosts, and had distributed the powder made out of this concoction to be deposited in the wells whence Christians drew water. The report spread to Chatel, Chatelard, and Bern; and from the last-named place special messengers were sent to all the Swiss and Upper Rhine towns, which soon produced the natural effect. At Zurich, where the new charge was combined with the old blood accusation, several Jews were burned (Sept. 21, 1348), while the rest were expelled (Schudt, "Jüdische Merkwürdigkeiten," i. 323). 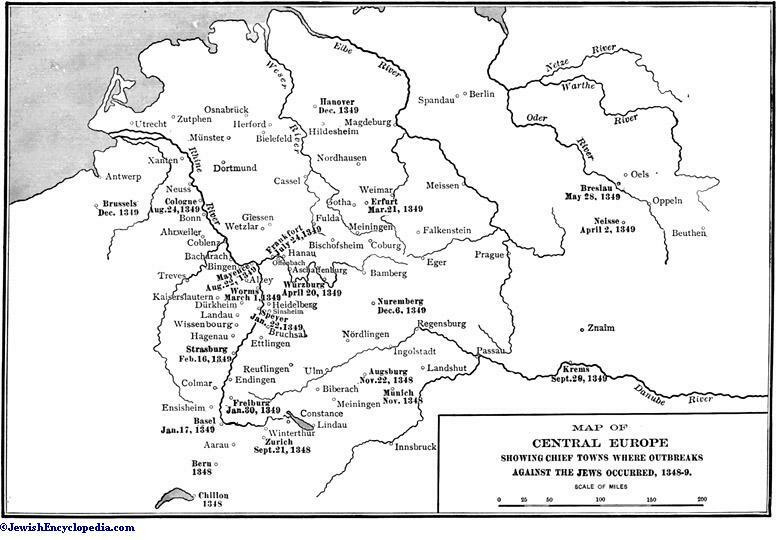 During the month of November the rumor reached Augsburg (Nov. 22), Würzburg, and Munich, and spread through eighty towns of Bavaria, where massacres of the Jews occurred. In the following month the great epidemic reached the Upper Rhine with the same results. At Freiburg in Breisgau, Jan. 30, 1349, all of the Jews, except twelve of the richest, were slain, the latter being reserved solely that their riches might be appropriated. Here it was reported that four Jews of Breisach had been sent to Freiburg with the poison, which they had obtained at Basel, and that all of the Jews of Strasburg, Basel, Freiburg, and Breisach were in the conspiracy. On Jan. 22 the Jews of Speyer fell victims, several being slain, and several killing themselves to escape baptism, while others, less firm-spirited, accepted baptism as the sole refuge from death. Meanwhile correspondence had been carried on between the town councils of Basel, Cologne, Chillon, and Strasburg, containing the substance of the so-called confessions. At Strasburg the mayor refused credence to the rumors, and declared his intention of sustaining the Jews; whereupon he was removed from his post, and more than 2,000 Jews of the city were put to death (Feb. 16, 1349). The deeds belonging to the latter were seized and destroyed (showing the real motive of the act); and the debtors of the Jews gave assurances to the citizens of protection from the consequences of the massacre (Stobbe, "Juden in Deutschland," p. 189). 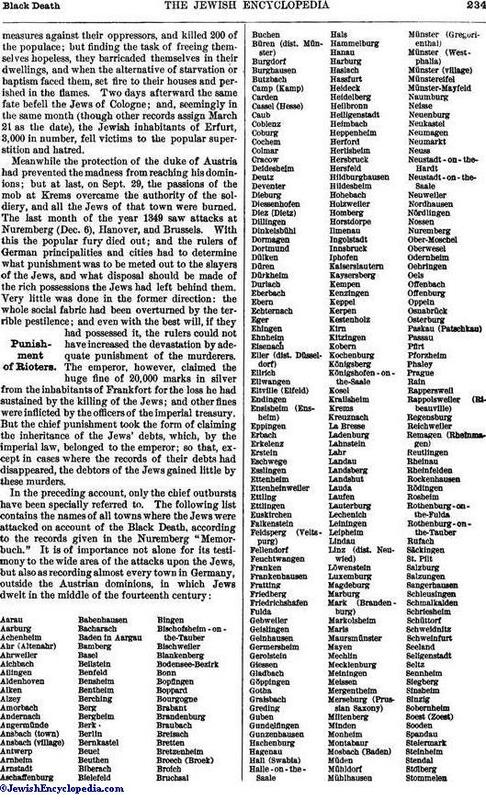 The Jews of Worms were the next victims, and no less than 400 of them were burned March 1; while on July 24 the Jews of Frankfort preferred to offer themselves up as a holocaust, and in so doing burned part of the city. The largest number of victims is recorded at Mayence, where no less than 6,000 are said to have been slain Aug. 22, 1349. Here the Jews for the first time took activemeasures against their oppressors, and killed 200 of the populace; but finding the task of freeing themselves hopeless, they barricaded themselves in their dwellings, and when the alternative of starvation or baptism faced them, set fire to their houses and perished in the flames. Two days afterward the same fate befell the Jews of Cologne; and, seemingly in the same month (though other records assign March 21 as the date), the Jewish inhabitants of Erfurt, 3,000 in number, fell victims to the popular superstition and hatred. Meanwhile the protection of the duke of Austria had prevented the madness from reaching his dominions; but at last, on Sept. 29, the passions of the mob at Krems overcame the authority of the soldiery, and all the Jews of that town were burned. The last month of the year 1349 saw attacks at Nuremberg (Dec. 6), Hanover, and Brussels. With this the popular fury died out; and the rulers of German principalities and cities had to determine what punishment was to be meted out to the slayers of the Jews, and what disposal should be made of the rich possessions the Jews had left behind them. Very little was done in the former direction: the whole social fabric had been overturned by the terrible pestilence; and even with the best will, if they had possessed it, the rulers could not have increased the devastation by adequate punishment of the murderers. The emperor, however, claimed the huge fine of 20,000 marks in silver from the inhabitants of Frankfort for the loss he had sustained by the killing of the Jews; and other fines were inflicted by the officers of the imperial treasury. But the chief punishment took the form of claiming the inheritance of the Jews' debts, which, by the imperial law, belonged to the emperor; so that, except in cases where the records of their debts had disappeared, the debtors of the Jews gained little by these murders. It is somewhat difficult to account for the complete helplessness of the authorities against these outbursts of popular fury. It was fully recognized at the time—as, for example, by the town council of Cologne—that an outbreak against the Jews might imperil the social order generally. The loss to the imperial and princely treasuries was immense. Yet, so far from taking any steps to prevent the outbreaks, the emperor in several instances gave beforehand practical immunity to the perpetrators of the crime, by making arrangements as to what should be done with the houses and goods of the Jews in the event of a riot. This happened at Nuremberg, Regensburg, Augsburg, and Frankfort, and, doubtless, in other towns. There can be little doubt that the authorities shared the prejudices of the mob, and, with few exceptions, believed in the dread rumor of well-poisoning. 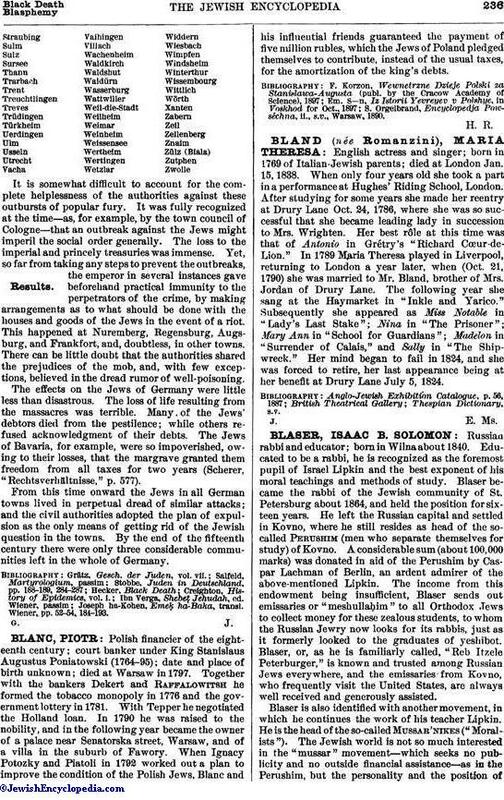 The effects on the Jews of Germany were little less than disastrous. The loss of life resulting from the massacres was terrible. Many of the Jews' debtors died from the pestilence; while others refused acknowledgment of their debts. The Jews of Bavaria, for example, were so impoverished, owing to their losses, that the margrave granted them freedom from all taxes for two years (Scherer, "Rechtsverhältnisse," p. 577). From this time onward the Jews in all German towns lived in perpetual dread of similar attacks; and the civil authorities adopted the plan of expulsion as the only means of getting rid of the Jewish question in the towns. By the end of the fifteenth century there were only three considerable communities left in the whole of Germany. Joseph ha-Kohen, Emeḳ ha-Baka, transl. Wiener, pp. 52-54, 184-193.